BEFORE: I get to travel across the pond today for one of Danny Boyle’s first films, Trainspotting. Expectations are high due to word of mouth and the fact that Ewan McGregor and Robert Carlyle both star. AFTER: If you want to talk about a never-ending story, Trainspotting is a great example. There must have been at least three or four times where everything seemed to be wrapping up; time for the film to end. But wait, hold on a second, that’s not the ending. Keep on watching as the same thing happens all over again. Now I understand, this has to do with the drug addiction, how hard it is to quit, and how easy it is to relapse. By showing almost the exact same events over and over again, that adds to what the characters are feeling. It just isn’t well done. Traffic and Pulp Fiction, while not the same as Trainspotting, cover similar ground and both do it better. I commend Danny Boyle for the work he did and there were many good parts in Trainspotting. The one that comes to mind is when Renton (Ewan McGregor) is detoxing with the aid of his parents. Not only was the scene itself well written and acted, but the cinematography was great as well. Some great uses of wide angle lenses and large depth of field gave the scene a very psychedelic and trippy feel without using weird and crazy colors. As far as drug addiction films go, Trainspotting was not the best. It was by no means a bad film, but it doesn’t fare well against other films in its genre. 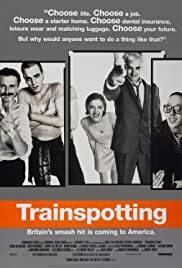 I’ll leave you with a question to ponder: why is the film called Trainspotting? I would love to know.